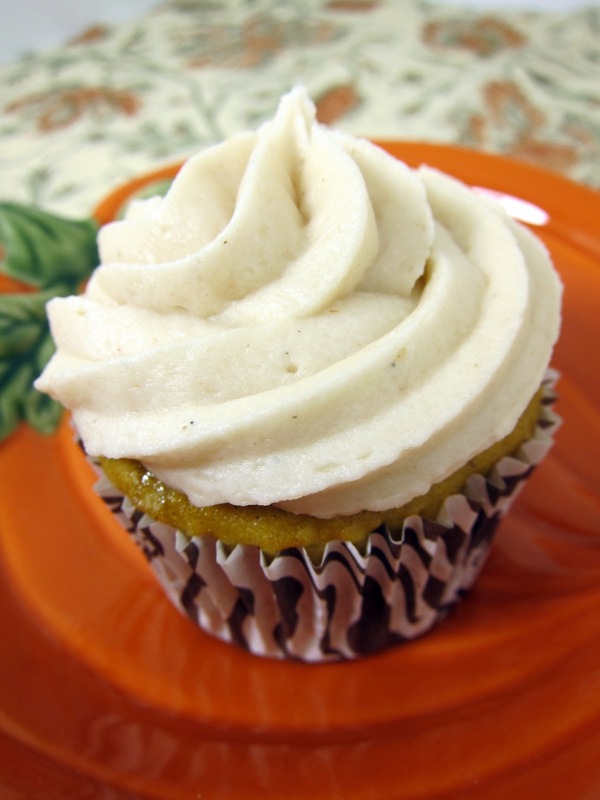 These cupcakes are a great way to enjoy pumpkin. They are super moist and full of great flavor. The cupcakes couldn't be easier. I used a box of yellow cake mix, canned pumpkin and pumpkin spice. The pumpkin added a nice color and kept the cupcakes really moist. I had some leftover apple butter from the White Chocolate Macadamia Nut Cookies I made last week, so I added it to my favorite buttercream. It complemented the pumpkin spice cake perfectly! I took these cupcakes to work and everyone LOVED them. These would be great for Thanksgiving dessert or any time. Bake 19 to 24 minutes or until toothpick inserted in center comes out clean. Cool in pans 10 minutes; remove from pans to cooling rack. Cool completely, about 30 minutes. Frost with Apple Butter Buttercream. In the bowl of an electric mixer fitted with the paddle attachment, cream butter until smooth and creamy, 2 to 3 minutes. With mixer on low speed, add 6 1/2 cups sugar, apple butter, 2 Tbsp whipping cream, and vanilla; mix until light and fluffy. If necessary, gradually add more powdered sugar and whipping cream to reach desired consistency. LOVE the little pumpkin plate! Where can I find those? Yumm! That cupcake looks delish. The buttercream frosting sounds amazing! I love apple butter! Something with Butter in the title 2 times has to be good. Oh I love them, they look so good! These sound fabulous! I love the apple butter in the frosting!! Would these have to be refrigerated? These are excellent! I couldn't find any caramel bits at the grocery store I stopped by, so I omitted them. I brought half of the cupcakes to work this morning and my boss ate 4 of them before 8:30am.. lol. All of my co-workers requested that I bring them to our Thanksgiving meal.